A Red-legged Partridge, Alectoris rufa, in Kirkmichael, Scotland. Asia, Africa, and the Middle East. Partridges are ground-nesting seed-eaters. These are non-migratory birds of dry, open and often hilly country. The nest in a scantily lined ground scrape laying up to 20 eggs. They feed on a wide variety of seeds and some insect food. necessary will fly a short distance on rounded wings. found in Europe, Africa & Asia. The Red-legged Partridge, Alectoris rufa, is a gamebird in the pheasant family Phasianidae of the order Galliformes, gallinaceous birds. It is sometimes known as French Partridge, to distinguish it from the Grey or English Partridge. flanks and red legs. When disturbed, it prefers to run rather than fly, but if necessary it flies a short distance on rounded wings. This is a seed-eating bird, but the young in particular take insects as an essential protein supply. The call is a three-syllable ka-chu-chu. migratory terrestrial species, which forms flocks outside the breeding season. of black streaking, bold rufous and black flank-bars, a cream throat, pink legs, and a red bill and eye ring. are pale blue-grey, and the bird has a narrow off-white supercilium running from above the lores to the sides of the lower nape. buff-brown feathering on the ear-coverts, adjoining the black. The eye is surrounded by a bright red eye-ring. They are among the favourite targets for bird-hunters in Spain. Read more here. collar breaking into dark streaks near the breast. 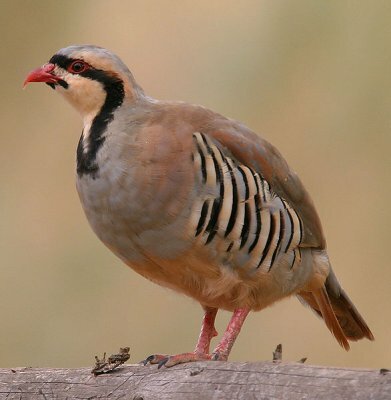 Their song is a noisy chuck-chuck-chukar-chukar from which the name is derived. The Barbary partridge, Alectoris barbara, has a reddish brown rather than black collar with a grey throat and face with a chestnut crown. 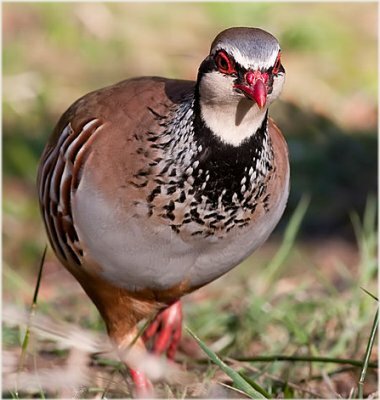 Other common names of this bird include Chukker (sometimes spelled as 'Chuker' or 'Chukor'), Indian Chukar and Keklik. into Africa on the Sinai Peninsula. The habitat in the native range is rocky open hillsides with grass or scattered scrub or cultivation. have not persisted and are probably extinct. A small population exists on Robben Island in South Africa since it was introduced there in 1964. Alectoris graeca of Greece and Bulgaria and western Europe. 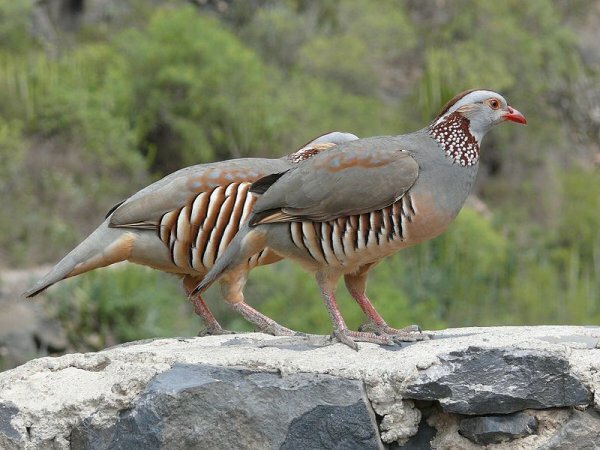 The Rock Partridge, Alectoris graeca, is a gamebird in the pheasant family Phasianidae of the order Galliformes, gallinaceous birds. 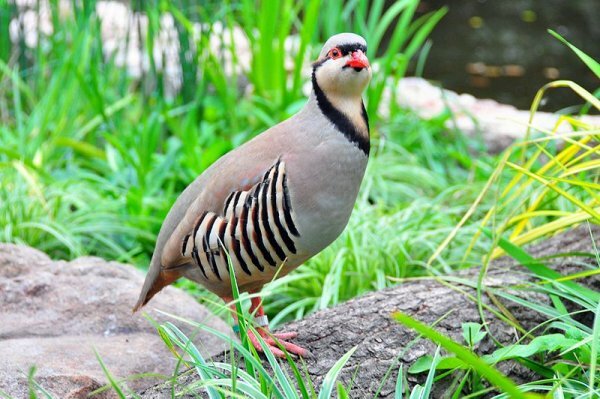 eastern equivalent, the Chukar Partridge, Alectoris chukar. This is a resident breeder in dry, open and often hilly country. It nests in a scantily lined ground scrape laying 5-21 eggs. The Rock Partridge takes a wide variety of seeds and some insect food. 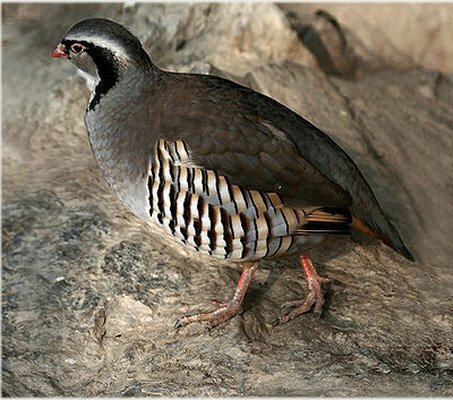 The Rock Partridge is a rotund bird, with a light brown back, grey breast and buff belly. The face is white with a black gorget. distinguishes this species from Red-legged Partridge. The song is a noisy ga-ga-ga-ga-chakera- chakera- chakera. of the Sicilian population may be more precarious and certainly deserves attention. The Barbary Partridge , Alectoris barbara, is a gamebird in the pheasant family Phasianidae of the order Galliformes, gallinaceous birds. 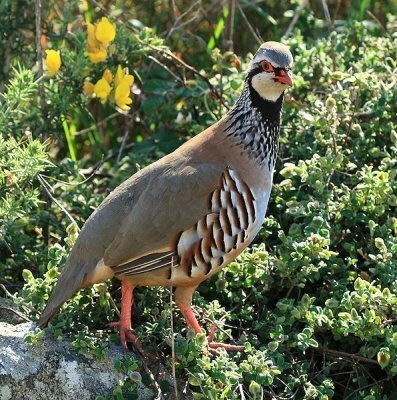 This partridge has its main native range in North Africa, and is also native to Gibraltar and the Canary Islands (Ssp Alectoris barbara koenigi). It has been introduced to Portugal and Madeira, though there are no recent records of this species on the latter islands. It is also present in Sardinia. It is closely related to its western European equivalent, the Red-legged Partridge, Alectoris rufa. This 3336 cm bird is a resident breeder in dry, open and often hilly country. It nests in a scantily lined ground scrape laying 10-16 eggs. The Barbary Partridge takes a wide variety of seeds and some insect food. a short distance on rounded wings. It is similar to the Red-legged Partridge, but it has a different head and neck pattern. The song is a noisy tre-tre-tre-tre-tre-cheeche-tre-tre-tre. The Barbary Partridge is the national bird of Gibraltar. Now more than 600 birds on our site! List here.